Song "Northern Girl" (Russian varian - "Devochka s severa"
Votes for Russia Cyprus (5), Greece (2), Estonia (10), Israel (1), Finland (3), Malta (8), Romania (10), Latvia (10), Lithuania (6). -Julietta M. (Female-Transvestit from Sankt-Peterburg) - song "Svetlaya noch"
Final selection was done between 3 entries: Kristina Orbakaite, Vitas and Prime Minister. Comission experienced a lot of difficulties in this choice. Finally dilemma was solved in favour of Prime - Minister, which represents the popular European style of boy bands. Motives were explained by Igor Matvienko: there are enough of girls in the contest this year, then Gypsy-Black-Blone male band will have more chances, and their song is more energetic than Orbakaite's one. It was very difficult to take the decision - said producer of Channel One Aleksandr Faifman - but that was joint decision. Lev Leshenko admitted that they didn't put any points as in preselections in other countries, but just put a crosses near the names. But still main contenders besides us were Kristina Orbakaite and Vitas. Vitas did not qualified because he had no song, so Jury was on it's meeting on 26th of February selecting between PM and Orbakaite." "I consider ESC to be the only method to attract everybody's attention. If we are lucky and sign a deal even with not so big company then I think we'll present competitive material. And project in Europe is far more interesting than what we are doing here, in Russia. Even though it is still dream we of course understand that successful performance will strengthen our position in Russia and recognition at home is always pleasant. We've got an idea a year ago when question who will go to Copenghagen was discussed. But it was too difficult to contend with Mumiy Troll, cause everyone had an illusion that they will be attract big attention there. I think that now in Russia only Prime Minister band in quality of product, vocal of musicians and in professionalism can be international." "Music was written by my friend and partner in FBI music Kim Breitburg. Idea of the song, content of first verse and title were invented by me, my friend Karen Kavaleryan then wrote whole lyrics and then Irina Antonian corrected the style. Last grammatical agreement and correction of some words we did with help of my friend from New-York Mikhail Plotkin and his american friends. English language was chosen to be 100% understanded in Europe." As Premiers told themselves song "Norther Girl" is adressed to the Northern audience and Southern men, to show them how attractive Northern girls are. "This song is more European and we hope that European viewers will like it", says singer Vyacheslav Bodolika. On his opinion - European standard is good melody, arrangement and performance itself. Unfortunately band didn't submit in time preview video for their song and in most of the countries only concert performance (shooting done by ORT to show idea of stage performance) was shown instead. Original preview video was shot couple of weeks later. Video was perfect and clearly met the opinion that noone of the other participants had video of the same quality. «Before final itself we are going on promo-tour to European countries. We will visit Riga, Tallinn and Helsinki. Also we will appear before public in Ankara and Tel-Aviv. In each city band will perform live concerts and also take part in talk-shows on TV and radio. As boys thereseves expresed they are happy to go on tour, cause they spend too many time in studio. They call this tour "dress rehearsal before ESC". No silly dances! Four man of fashion, in super stylish suits, with something like soviet state emblems and other things, also back-vocals would be made by 2 girls -white and black one, with 'mad' voices. 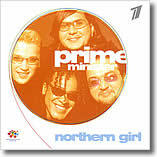 Official name of the band was also changed to Prime-Minister from Russian varian Premier Ministr. Decision was made by band manager E. Fridlyand. He thinks that this name sounds coolier than Premier-Ministr. Also few lines of the song were changed to get more accurate grammar and prononciation. Russian delegation consisted of: representatvies of Prime-Minister band headed by Evgeniy Fridlyand, chief of international department of ORT Elena Arkhipova, general producer of ORT Alexandr Faifman, press-service chief Igor Burenkov, editors of Russian Radio and Europe Plus radio and mass media representatives. At official press-conferences members of the groop told to mass media representatives that they are sure in their win and are improving their performance day by day. From the other competitors they had named only Swedish entry that deserved to share first place with Russia. Head of delegation Elena Arkhipova has describe excellent possibilities to organize Eurovision in Moscow and had declared that they are ready to invite contest there. Evgeniy Fridlyand added "Russia is waiting to host the contest, that's why we are here." Probably, even only for get a feeling of support from our fans and friends, it is worth to take part in such contests. So now we again sincerely thank everyone who believed in "Prime-Minister", stimulated us and gave us energy booster before and after the contest. Special thanks to president of ORT broadcaster Mr. Konstanntin Ernst and general manager Mr. Alexander Fifeman. Without their help and support it would be impossible for our pop-musicians to take part in events of such a high level. Prestige of the country is maintained not only at sport arenas and global political sammits but also at song contests. Critics often critisize ESC for it's excessive monotony, middle course and it's bringing to common "eurostandart". Possibly this allegations are not groundless. But from the other side, what song can satisfy huge audience of Eurovision,which includes not only people of different nationalities but also different mentality? Swedes like one music and Turks very different. So, even members of Russian jury Larisa Dolina and Alexander Koutikov when appraising results of voting had only to make a helpless gesture, being unable to explain the logic of giving points. No one will debate that our team consists of proffesional musicians. May be one of our faults was that we treated this contest as proffecionals. But neither level of music or perfomance, nor quality of the song, as appeared, play role. So we of course were hugely disappoined analysing the results. From our part we tried to extend format of contest by presenting song "Norhern Girl". It cannot be denied that it stood out against the background. In a week before contest our "Northern Girl" were in all charts of Baltic radiostations. When being in Tallinn we heard flattering words from many experts and specialists in showbiz. Dave Benton, one of the winning duo 2001, told press that he is counting on "Northern Girl". Star of Soviet music Jak Joala also admitted that we have all chances to win. At that time noone was counting on Maria Naumova who got in result maximum score. In precharts her song never was in 10. Huge favourits were Swedish trio "Afro-dite" with really strong song. But in the result Swedes finished 9th and Prime-Minister 10th of 24 contestants. Also if we'll take into consideration that such countries as Germany, Finland, Denmark, Switzerland ended in a huge failure, then we should treat our 10th place as little success. Because Russia will take part in the contest next year. In this situation it is very difficult to understand reaction of russian mass-media, who covered the event in a very peculiar manner. Noone of columnists made a concrete suggestion, what should be done to win. Quite the contrary, majority of journalists practised in who can bite more painfully. 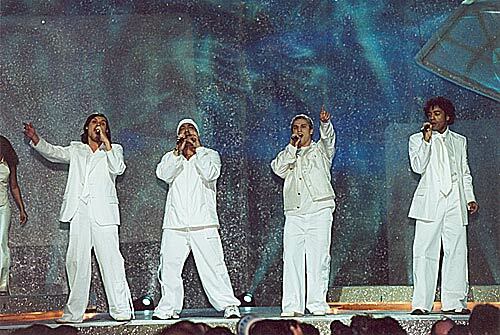 For some purposes they mentioned Alsou, who took 2nd place in 2000. Yes, she is talented girl, but this "silver" is not the win of Russian shobiz. Song "Solo" was written by american authors, dancing was arranged by Englishmen, back-vocal also was by guys from UK. Plus this project costed a lot of money. We were going to the contest precisely as representatives of Russian showbiz, with song written by Russian authors Kim Breitburg, Karen Kavalerian and Evgeny Fridlyand. Entering the scene of "Saku Suurhall" we felt burden of responsibility, and God see, we were trying to do our best. But may be because of high strain, tiredness and then... unexperience some of us just burned out. And the final perfomance is just a peak of an iceberg. Before it we had a week marathon in Tallinn, which included receptions at embassies, interviews to the media and exaustive hours of rehearsals. That of course affected on our nerves. But we should say that we gained a lot of experience we can share with future representatives from our country at ESC. More over, for success of Russia at such kind of events, we need special productial-managerial groop which will unite all the people concerned. It will help for futher moving forward towards world of western showbiz. Evgenii Fridlyand: we should take Eurovision more easily than for example Tchaikovski contest of classic music. This is first of all entertainment television show with political flavour. Today Europe is uniting and only with such a cultural connections they can unite so different countries. The place acheived is not important for anyone. It is just sort of holiday, during which singer can get a lot of promotion in his own country. I have spent a lot of own money for the contest (costumes, recording of the song and other) - I paid 150 thousand USD from my own pocket, but guys from the band and me myself got their very big and valuable experience. “I have been singing for as long as I can remember myself. Night after night I would sit by my tape player listening to songs by Boys II Men, Mariah Carey, Whitney Houston, repeating after them,” – says Jean. These tapes with voices of Western performers became his teachers. Today Jean has no trouble singing any song, be it from the repertoire of Michael Jackson, Brian McNight, Stevie Wonder or any other black kings of soul music. Besides being a singer and song writer, Jean is the “psychotherapist” of the group. He is the soothsayer and the troubleshooter, and spirit lifter in the group. He likes night life and discos. 2. For Peter Jason (born September 9, 1979 in Moscow), his elder brother “was a colossal influence.” The boys’ parents (father – a professional geologist from Kenya and mother – a Russian interpreter from English) were not artists, but respected their sons’ interest in music. Both went to music school to study the piano. And already at the age of 8 the younger brother, Peter, would play serious classical compositions in the Small Hall of the Bolshoi Theater. Yet, Pete’s music talent was fully revealed only in the Moscow Boys Choir, where the future premier was sharpening his vocal skills by singing classics from Bach to Mozart. He likes to stay at home and devotes all his free time to music; he is putting together a home studio. He writes songs, but, he says, they do not fit the project, so he puts them away until he is ready to do a solo album. 3. Vyacheslav Bodolika (born June 18, 1977, in the town of Ungeny, Moldavia) joined the group when the first songs were being recorded. He comes from the family of musicians (his parents and elder sister play instruments and sing well). “My father, -- Slava says proudly, -- is a great accordion player.” Thus, Slava had no choice but to become a musician. Upon graduation from the music school (class of violin), Bodolika went on to music college and graduated with honors (classes of jazz singing and violin). While at college, the musician started a jazz-rock group Intro. “I was in my first year at the Kishinev Conservatory, -- recalls Slava, -- and was going to become a singer, when I was unexpectedly offered to join Prime Minister trio. When the musician came for the first recording session, he brought along two of his songs which became the group’s first hits: “Atomic Sense of Love” and “Dirty Dances.” Vyacheslav Bodolika is the most productive author of the four group members; he is also the most serious, a family man, the only father in the group. 4. The last to become Prime Minister was Marat Chanyshev (born March 25, 1975, in Moscow). First, Eugene Fridlyand liked his song “Two Diamonds”, but as he came to know the author better, he invited him to join the group. Marat has no professional vocal education. Like Jean, he studied by singing along with CDs, with albums by Freddy Mercury playing an important part. He learned to play the clarinet during his five years at music school. Later Prime Minister continues to be one of the brightes Russian music stars and one of the very small number of the bands know for it's live performances. 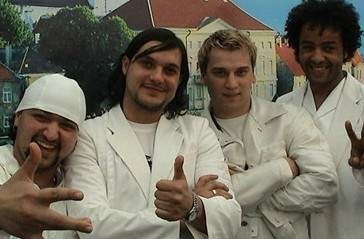 Their song "Northern Girl" till 2006 was most radio rotated song from the list of the songs which represented Russia at Eurovision song contest. In 2005 all members of the band were officially fired by their producers. In fact, at the moment there are two bands co-existing under same name at the present moment - new band with new members which is backed by famous producing agency FBI-Music and most professional team of songwriters, and old members of the band, who continue illegally using the name of the band and perform their old hits. Ona letit segodnya rovno v dva. 3. "Devochka s severa" (Russian version) - album "Devochka s severa"
6. "Northern Girl" live (live performance) - album "Very Important Persons"
7. "Devochka s severa" live, duet with Marie Naumova (live performance) - album "Very important persons"
Back to the front page of the project "Russia at Eurovision"